In[Perfektion] is a Portuguese music project that began back in 2005. The band is composed of two former members of the now-defunct band Twilight Garden. The members of the band In[Perfektion] are Walter, who provides the vocals and is on the synths, and guitars; Charlotte, who is on synths and programming, and Hypecrash, a Live Member on the synths. Their third release, “Perfekt Chaos,” is a five-track dark electro EP that was originally released in 2007. Now, the EP has been remastered is now available for free download via the netlabel Enough Records. “Perfekt Chaos” is a fun, pulsating, high-energy EP that one can play at clubs or dance parties. You can also use the music as background music for working out. Every song on the EP has a distinct sound and a driving beat that gets the blood pumping. Walter’s vocals, present in almost all tracks, and a gruff and urgent counterpoint to the electronic music. In[Perfketion] also likes adding snippets of movie dialogue to their songs, as in the opening track “Imitation of Life” and “Tech-No-Logic.” This adds an interesting dimension to their songs. Some of the songs sound almost alike, but there are definitely differences that make each song a unique listening experience. In[Perfketion] throw enough curve balls within each song to keep things interesting, while Walter’s vocals and the movie dialogue snippets add flavor to the proceedings. 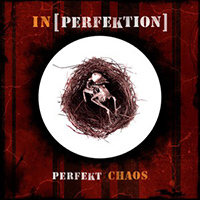 All in all, if you’re looking for some energetic, danceable music, then “Perfekt Chaos” is a great download for you.